Over the years more and more hardware has become compatible with Linux, which has made sourcing components for a Linux computer far easier. With this improved support for the operating system comes the ability to interrogate components and find out information about them via the Terminal. For instance you might instruct the hard disk drive to reveal its type and size in Ubuntu, or find out DVD drive info in Debian. 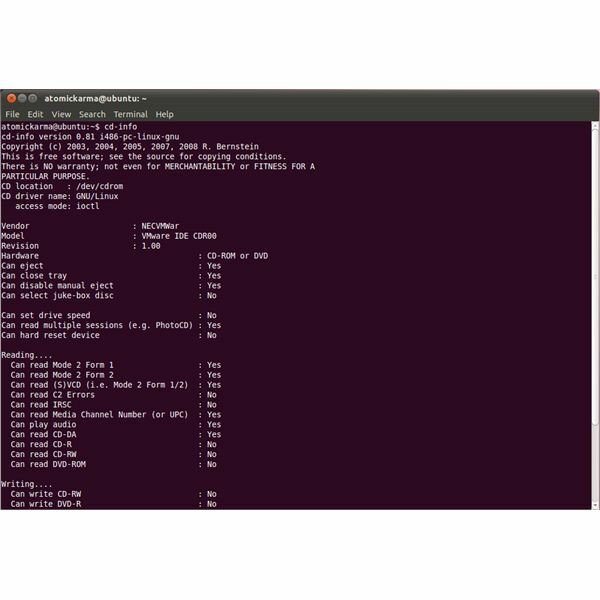 These commands work across the Linux distros and can be very useful in getting information that you might not have access to without removing the device, such as the manufacturer and serial number. The Terminal is the very useful command line prompt that is available in Linux to perform certain tasks. Software can be installed in this way, as can changes to the system configuration. A Terminal console is typically accessed by going through the Applications > Accessories menu, although your particular distro might be different. This command will need your su password to execute, and will download and install the necessary tools for finding out DVD drive info in Debian, Ubuntu or whatever Linux distro you use. This will return details about your device manufacturer, model, the type of hardware and other information such as its read and write capabilities. This command returns information about storage devices on various buses on your system. (many hdparm commands are available and these can be all viewed by typing hdparm -i). These commands are just the tip of the iceberg of what is possible in the Terminal. How Do the Commands Work? Information about the device is stored in the microprocessors that control the hard disk or DVD drive, and these details can be interrogated by these commands. Some information might change; for instance if for some reason you were to upgrade the firmware of your DVD drive, a different version number might be displayed. These details can be viewed on any computer that permits a command line prompt to access storage devices, and similar commands are also available in Windows and Mac OS X.